Vermeer's 1663 work, Woman in Blue Reading a Letter, is back on display at the National Gallery after its first visit 20 years ago. The National Gallery's first Vermeer exhibit 20 years ago drew huge crowds. It ran from November 1995 to February 1996 — during which the federal government shut down twice, and a major blizzard hit the East Coast. Arthur Wheelock, who curated that exhibit, says the paintings made a huge impression, even on folks who couldn't make it. "I even got a letter from a prisoner in Leavenworth who obviously could not come, but ... just knowing that this was there somehow made him feel better about life," Wheelock says. 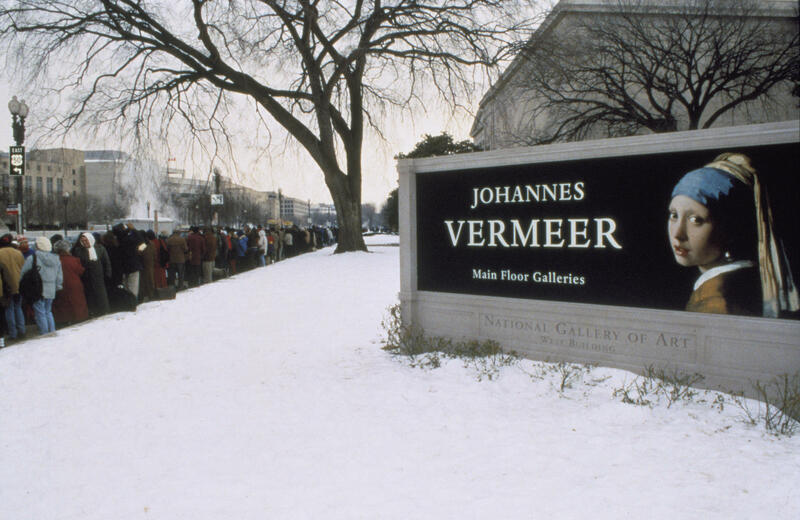 Twenty years ago, lines formed well before dawn — even though the gallery didn't open until 10 a.m. But in the middle of all the Vermeer excitement the federal government shut down, the result of a battle between Democratic President Bill Clinton, House Speaker Newt Gingrich and the Republican Congress. And then right after New Year's, a huge blizzard hit Washington. The gallery was closed for 19 days out of a three month exhibition. When the doors finally reopened, the crowds rushed in and then fell silent in front of the paintings. "It was the quietest show I've ever been in," Wheelock recalls. "People would just stand and reflect. The sense of reverential experience of being in the company of all these great treasures." Now, one of those treasures is back at the National Gallery to mark the anniversary. Woman in Blue Reading a Letter is visiting from the Rijksmuseum in Amsterdam. She stands in profile, bathed in Vermeer's pale yellow Northern European light. On the table in front of her, a strand of pearls and the first page of her letter. "I think she's standing there doing her morning toilette, getting dressed, and the letter has arrived," Wheelock says. She's stopped everything to read it. Vermeer captures an exquisite moment of concentration. What does the letter say? Who wrote it? Why her trace of a smile? Vermeer never tells. Perhaps it's from someone very far away — maybe on one of the trading ships making the Netherlands so rich in the 1600s. Perhaps it's someone she loves. "I'm sure anybody in this room looking at these paintings would come up with their own little story," says Wheelock. "That's one of the wonderful things about Vermeer. He allows all of us to engage in our own personal way." A visitor might feel a bit intrusive. It's such an intimate scene. Might looking be an invasion of her privacy? "I think we always approach Vermeer quietly because we've not been invited in," Wheelock says. "Generally there is some object — a piece of furniture — separating us from her. So we are kept at a distance." Caught up in her gorgeously painted moment of concentration, Woman in Blue Reading a Letter remains at the National Gallery until Dec. 1. The museum staff is hoping for neither snow nor sleet nor government shut down this time! One of those quiet Vermeer women is back in Washington, smack in the middle of all the political clatter, debates, speaker votes, a solitary serene 17th-century female in a pale blue satin jacket reading a letter. NPR special correspondent Susan Stamberg says the woman's visit marks an important anniversary for the National Gallery of Art. SUSAN STAMBERG, BYLINE: Twenty years ago, the gallery put on the first Vermeer retrospective ever, 22 of only some 35 Vermeers known to exist, two-thirds of his work. The show was a big hit despite some major problems. Dutch master Johannes Vermeer's paintings made a huge impression. ARTHUR WHEELOCK: Even people who could not come - I even got a letter from a prisoner in Leavenworth. STAMBERG: Arthur Wheelock curated the exhibition. WHEELOCK: Who obviously could not come, but he just knowing that this was there somehow made him feel better about life. STAMBERG: Crack of dawn, people lined up to get in. WHEELOCK: Five in the morning, 3 in the morning. STAMBERG: For what time, what did you open? STAMBERG: In the middle of all the Vermeer excitement, the federal government shut down. President Clinton, House Speaker Newt Gingrich, and the Republican Congress choreographed that little maneuver. WHEELOCK: And then we had in Washington these amazing blizzards where D.C. was closed. WHEELOCK: It was the quietest show I've ever been in. People just would stand and reflect, the sense of reverential experience of being in that company of all these great treasures. 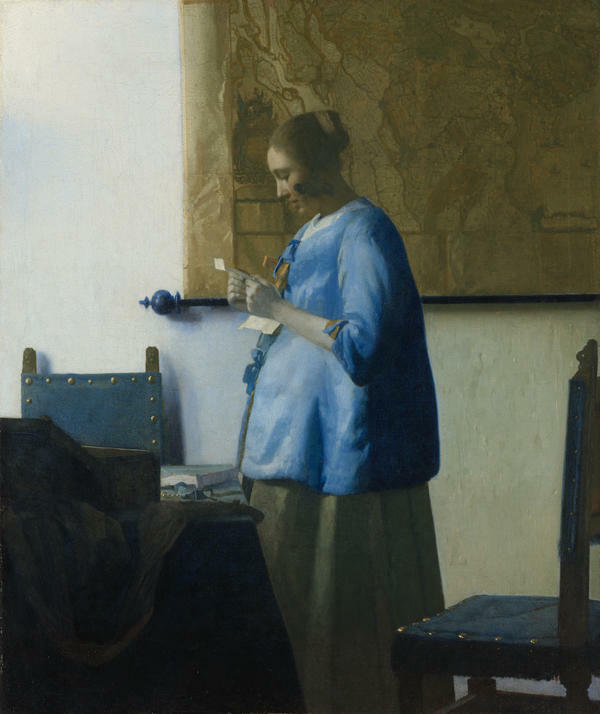 STAMBERG: Now one of those treasures is back at the National Gallery to mark the anniversary, "Woman In Blue Reading A Letter" from the Rijksmuseum in Amsterdam. She stands in profile bathed in Vermeer's pale yellow northern European light, on the table in front of her, a strand of pearls and the first page of her letter. WHEELOCK: I think she was standing there doing her morning toilette, getting dressed, and the letter has arrived. STAMBERG: And she has stopped everything to read it, an exquisite moment of concentration. What's the letter say? Who wrote it? Why her trace of a smile? Vermeer never tells. I think it's from someone very far away, maybe on one of the trading ships making the Netherlands so rich in the 1600s, maybe someone she loves. WHEELOCK: I think that's a great interpretation. I'm sure anybody in this room looking at these paintings would come up with their own little story. That's one of the wonderful things about Vermeer is he allows all of us to engage in our own personal way. STAMBERG: The scene is so intimate. Is there a sense that this moment in which she is engaged that we are invading it as viewers, we are invading her privacy? WHEELOCK: I think we always approach Vermeer quietly because we've not been invited in. And generally, there is some object, a piece of furniture, separating us from her. And so we are kept at a distance. STAMBERG: Respectful, yes, even reverential and caught up with her in her gorgeously painted moment of concentration, "Woman In Blue Reading A Letter" remains at the National Gallery until December 1. In Washington, I'm Susan Stamberg. MONTAGNE: And you can get a look at Vermeer's "Woman In Blue" at npr.org. Transcript provided by NPR, Copyright NPR.